When it comes to durability, granite takes the cake. Not only is this countertop material visually stunning, but it’s quite resistant to damage. Granite countertops are also widely available in a selection of styles so you can easily find the right stone to match your design. Additionally, some varieties of granite stone are so dense that they don’t even require a sealant. Even if your granite does happen to stain, the good news is that the sun and rain will wash away the stain overtime. The runner up for durability is concrete. Concrete countertops are great for outdoor kitchens, however they can scratch more easily than granite. It’s also important to remember that concrete countertops can alter in appearance from sun exposure. If you stick to lighter earth tone colors for your concrete countertops, any sun fading will be less noticeable. Soapstone is great because it is naturally resistant to heat and staining, which for outdoor kitchens is a major plus. One word of warning however, is that if not properly maintained you can see this kitchen countertop start to deteriorate faster than it’s more durable counterparts. With regular sealing or oiling will prevent scratches and help to keep the stone looking more consistent in color overtime. 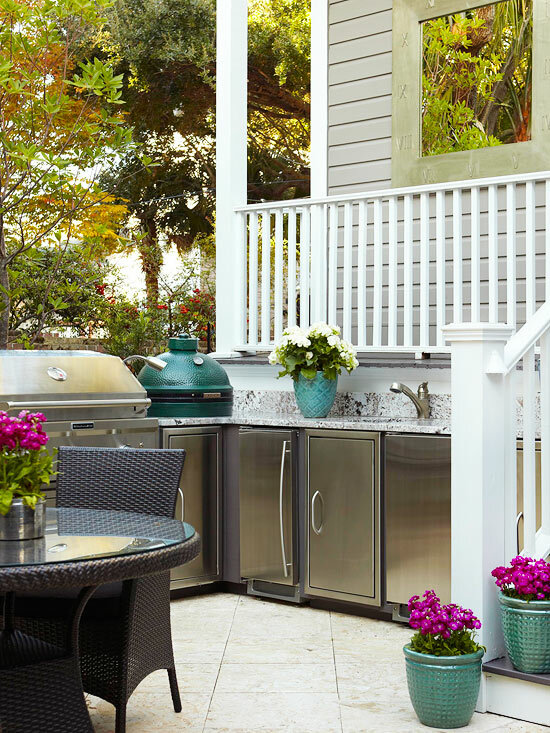 Not sure what stone countertop is best for your outdoor kitchen? Give us a call at The Edge Countertops. As experts in all things stone, we like to think we have a pretty good handle on helping you select the best countertop material for your needs and budget. Call us or click here for a free quote.